A 12 month-old baby girl was referred by a private paediatrician because of a left proptosis and right subconjunctival haemorrhage (Figure 1a and b). The CT scan in the private hospital revealed a retroorbital mass (Figure 2a, b, c and d). The girl has been unwell for a few weeks with loss of appetite. She had normal right reflexes with a non-reducible left proptosis. Fundal examination was normal and there was no relative afferent pupillary defect. Figure 1a and b. Left proptosis with right subconjunctival haemorrhage and some eyelid bruising. 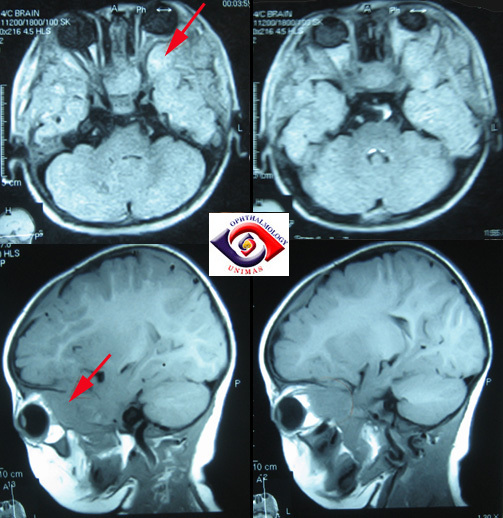 Figure 2a, b, c and d. CT scan showing a retro-orbital mass arising from the lateral orbital wall. 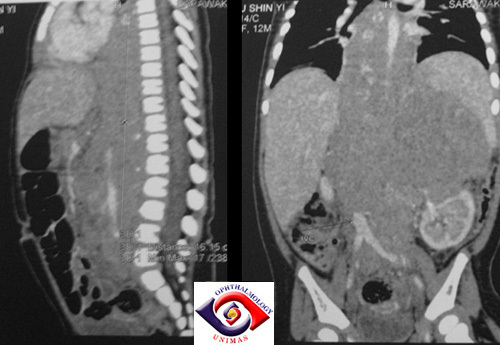 The abdominal examination revealed abdominal mass and the patient was referred to the hospital paediatrician for further work-up. The abdominal ultrasound (Figure 3a and b) revealed a suprarenal mass and the CT scans (Figure 4a and b) showed extensive paravertebral mass extending from the level of left atrium into abdomen with chunky calcification noted within the mass. There was an abdominal mass extending retroperitoneally and across midline till level of bifurcation of common iliac vein. The liver and spleen were not enlarged. Figure 3a and b. The ultrasound shows a large suprarenal mass. CT scan shows paravertebral mass. into the abdomen along the paravertebral region and into the retroperitoneal space. a. What is the most likely diagnosis? b. What other eye signs may occur with this condition?